Cannon Cove is the seventh attraction in Mario vs Donkey Kong: Mini-Land Mayhem!. Several palm trees and boats are seen in the background of the levels. The new feature in this level are cannons, which the player can use to shoot minis across the area. Several enemies are encountered here, such as Capture Kongs, Shy Guys, Fireballs, Fire Piranha Plants and Snifits. A new mini called Mini Pauline is introduced in this world, it has to be rescued along with three others in 7-4. The seventh encounter with Donkey Kong is highly similar to the first one. 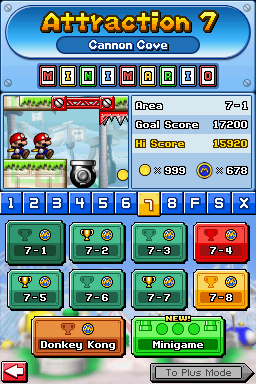 As the Mini Marios have to zap him by hitting three blue switches. But this time, they have to use cannons and girders to reach them. 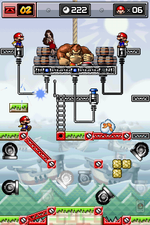 As for DK, he attacks by throwing barrels and changing the cannons' locations. Once defeated, he takes Pauline and escapes to the eighth attraction. One of the music tracks is based off the level music from Floor 2+ in Mario vs. Donkey Kong: Minis March Again!. This page was last edited on March 27, 2018, at 10:33.